Canadian artist Jeff Wall was born in 1946 in Vancouver, where he still resides and works today. Wall studied art history at the University of British Columbia between 1964 and 1970. He then went on to postgraduate study at The Courtauld Institute of Art, London from 1970 to 1973. Wall uses a variety of techniques in his photography, but the main crux of his art is, he states; “mid-way between the ‘Dialectic of Enlightenment’ and the ‘Society of the Spectacle’." He is interested in they way that the photograph works and uses the ideas of John Berger (“Ways of Seeing") to expose the image through the image itself. Wall uses tableaux vivants to construct his images, creating narratives that Roberts defines as conceptualized realism. This means that the images that Wall creates appear to be snapshots of natural scens, but are in fact constructed using actors, friends and extras to precisely stage the narrative that Wall wants to produce. In addition, Jeff Wall also uses digital manipulation techniques to construct the image and achieve the effects in his pictures. Everything in Wall’s image has been set up to tell a story through a series of clues. Representation of life as is created through realistic scenes that transcend traditional narratives and point to the camera’s presence. Wall’s post-conceptual scenes mimic the everyday and at the same time question its existence. Jeff Wall uses old paintings and literature as inspiration for his modern photographs such as the image shown here. “The Invisible Man" comes from the 1952 Ralph Ellison story with the same title, which is the account of a black man who has escaped street riots and ended up in a cellar. The story tells of the man’s existence in his underground home. One of the elements is that the man has collected 1,369 light bulbs and has connected them illegally in his cellar. 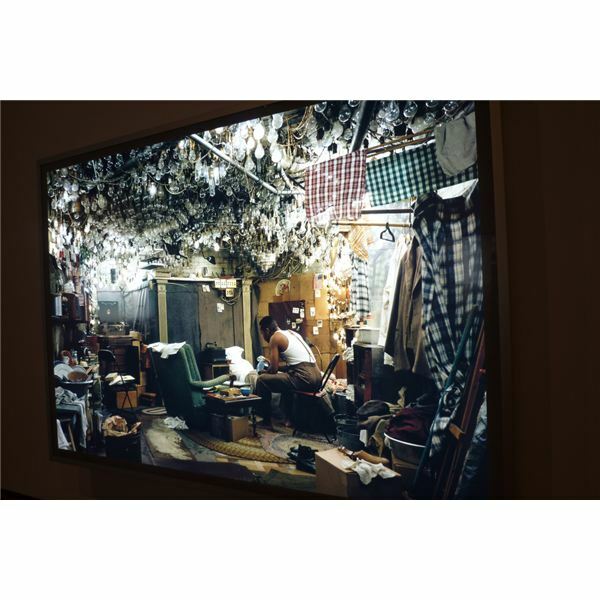 The idea of light and its use is deeply connected to Jeff Wall’s ideas and this image is displayed on a huge lightbox so that light is constantly needed to view the scene. The theme of people who are somehow hidden in society reoccurs often in Jeff Wall's work. In “Odradek, Táboritská 8, Prague, 18 July 1994," Wall uses the Franz Kafka story “The Cares of a Family Man" (1919) to create a narrative about abandonment and things or people that are hidden from the world. The image shows a young girl walking downstairs in an old, possibly abandoned building. The walls are moldy and crumbling and the open emptiness of the stairs with the girl descending makes this scene almost nihilistic in appearance. The water fountain juxtaposes the girl; its static rusty appearance is diametrically opposed to the life and modernity of the girl. The emptiness of the image is all-pervading and as with all Walls’ image this could be a documentary shot but Wall’s construction creates the artifice blurring lines between fact and fantasy. The manner in which Wall’s images are displayed is arguably as important as how he creates them. For instance, Wall has used large light boxes for display of his images in galleries. Charlotte Cotton, Department Head & Curator of the Wallis Annenberg Photography Department at the Los Angeles County Museum of Art states that these “give his photographs a spectacular physical presence. A light box is not quite a photograph, nor is it a painting, but it suggests the experience of both." Cotton also remarks upon the idea that these huge images are reminiscent of backlit billboards that can be seen in the street. The concept of creating art that is a spectacle is important in the work of Wall. He wants to draw attention to the fact that images that are used in advertising and even documentary photos can create a spectacle, and that post-conceptual photography should portray an awareness that art and photography as spectacles is vital. Exposing images that are now so prevalent in our society creating a constant capitalist spectacle have become the norm and the line between real and artifice is constantly blurred. Wall’s images cause the viewer to consider the photograph as well as the construction process of the image itself. These factors prompt the viewer to question his or her own relationship with the image. 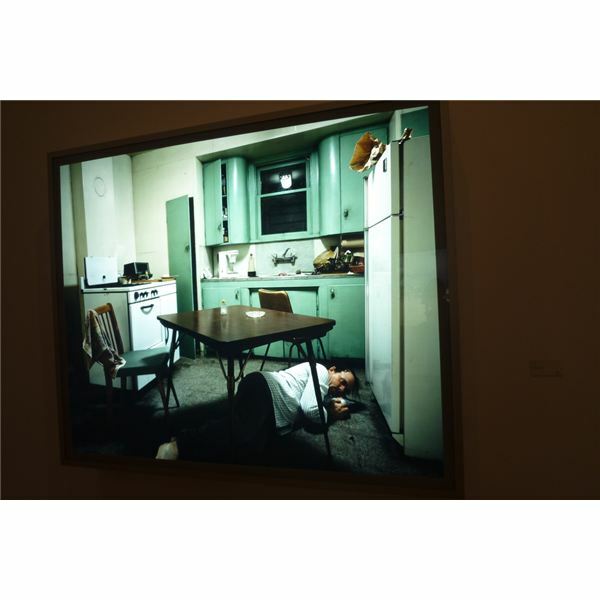 Jeff Wall produces work that fuses old and new ideas about representation. Perhaps most importantly, Wall’s art makes the viewer stop and think.